Overflowing toilets aren’t just unsanitary, they’re also hazardous to your health and to your home. But almost all toilets are prone to overflowing from time to time. Fortunately, Penguin Toilets has released an anti-overflow toilet that prevents overflows by incorporating a secondary drain. This drain reroutes the water that would otherwise spill over onto your bathroom floor into another pathway that leads to the bottom of the toilet and your home’s plumbing system. What Causes Toilets to Overflow? At Aqueduct Plumbing Company, we know that overflowing toilets is a common household crisis. And while it may seem like a minor inconvenience before it happens, overflowing toilets can expose flooring, cabinetry, and even members of your family to dangerous and unsanitary conditions. Your toilet is connected to your home’s primary plumbing line via a small drain line. Anything that blocks this line—or even other lines that connect to your home’s primary pipes—your toilet may become clogged and overflow. The pipes inside your home may be working correctly, but the problem could be further along the line. Sewer lines run from streets to homes through yards and gardens, and growing trees—along with their vast expanses of root systems—can wreak havoc on pipes, resulting in major blockages and overflowing toilets. Toilets should never be used as disposals for household or bathroom items except waste and toilet paper. Flushing things like sanitary products, plastics, cat litter, diapers, and other objects can quickly overload the toilet’s drainage system, causing water to quickly rise and spill onto the floor. 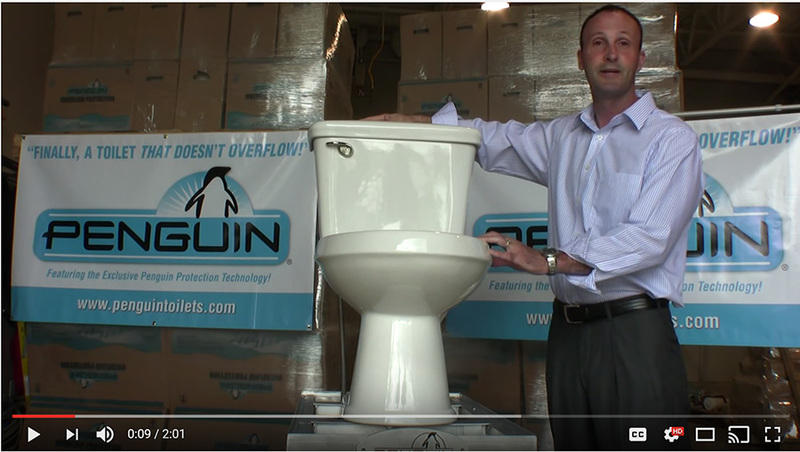 How Does an Anti-Overflow Toilet Work? Before water can overflow from a toilet, it must first rise beyond the rim. The anti-overflow toilet redirects overflowing water through three holes before it can spill onto your floor. After the water enters the three holes beneath the rim, it flows through a secondary drain on the side of the toilet. This secondary drain is separate from the main drain, which means it continues to work even the toilet is clogged. In the unlikely event that the three drainage holes beneath the rim of the toilet become clogged, a third drainage route just above them will reroute overflowing water to the secondary drain. The pipe and home water experts at Aqueduct Plumbing Company can handle all your plumbing needs. From overflowing toilets and water tank installation, to camera inspection and drain cleaning, we have the tools and experience to handle any plumbing job. Get in touch with us today. Call (281) 488-6238 to set up an appointment.